Amid the killing of 60 Palestinians by Israeli security forces and the opening of the US Embassy in Jerusalem, I spoke with TRT World on Tuesday about the political significance. I focus on the decision of the Trump Administration — and Trump family — to go “all-in” with Israel. 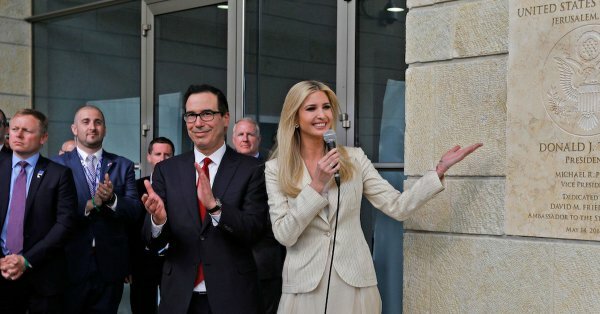 This juxtaposes the declaration of “peace” by Trump’s son-in-law Jared Kushner, at the Embassy ceremony, with the reality that the Administration is now aligned with the Netanyahu Government over Palestine and across the Middle East. The idea that the US is neutral, or can be a broker between Israel and Palestine, is gone. Wherever this heads — and it is likely to head for more confrontation rather than talks — the Trump Administration will stand with the Israelis…. Apart from the fact that a lot of Palestinians are being killed, it’s a no-lose strategy for the Administration. It as Bibbi who was caught on video boasting about how he sabotaged Oslo. It was Bibbi who having said he was for a 2ss, admitted there would be no 2ss under his watch, then flipped again. You’re perfectly safe in Tel Aviv. Of course you could stop treating the Palestinians like animals, end the occupation and make peace with your neighbors, but your country has decided it prefers to steal land.